Although it’s been a little over a week since the eye of Irma passed over Jacksonville, there are still residents who are waiting for the power to come on. In addition to that, some areas have experienced sewage backflow and other hazardous flood-related conditions that may make the drinking water unsafe. 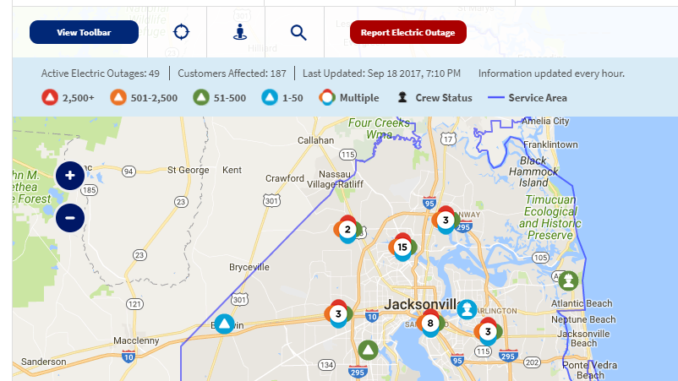 All residents are advised to keep up to date with the latest information at the Jacksonville Electric Authority’s website using this link. Even though some locals are still waiting for lights and air conditioning, JEA has done an incredible job so far of restoring services to a large number of reisdents. At the peak of the outages, more than 250,000 customers were left in the dark – and now just a week later more than 99% of the city is back online. The recovery project represents one of the largest electrical jobs in American history in terms of scale and speed of operations. Record flooding soaked downtown, riverside, and others areas near the river’s inlets, but as of today no hurricane-related fatalities have been announced within the Jacksonville area. Meteorologists and state leaders warn that citizens do not become too complacent: with Jose and Maria currently gaining strength in the unusually warm Atlantic waters, hurricane season is far from over. As supply chains come back online, everyone should be ensuring those hurricane supply kits are all topped off and ready to go – again!